So your house is not selling. It’s sitting on the market without offers while other houses in the neighborhood are selling while your home continues to linger. Feedback from your realtor says that potential buyers don’t like the kitchen. Realtors advise depersonalizing your home, (remove family photos and personal “clutter”), so buyers can get a better sense for how this home would fit their lifestyle. But how do you depersonalize your dated kitchen? Your father may have built or installed these cabinets or you may have selected your favorite maple wood stain but does that matter to the buyer? Remember, they are not buying for sentimental value. Wood-Mode Circa 1961, once upon a time this was current. Still great quality, but not current with newer, innovative design. Do you dig in and wait for the buyer who likes your taste to come along months down the line or do you appeal to more home buyers who desire the current trends and get your house sold quicker? Kitchen Circa 1990’s. Floors Circa 2015. Fresh coat of paint, hardware, new counter tops and splash and this kitchen would be charming! A former client was shocked that their house is still sitting on the market with really insulting low ball offers while the cheaply renovated neighbors house sold in 10 days. This is a sad case of letting your personal style getting in the way of selling your home. It doesn’t pay to be annoyed that your dated cabinets are better quality than your neighbor’s cheap but cute “ok-Ikea” kitchen. If it’s dated, even though it was in style when you remodeled 10, 20 or 30 years ago, facts are facts: out of style kitchens are a big fat negative for the buyer who wants a move-in ready home. Are you ready to drop $100,000 or more off of your asking price so you can sell your house? Ready for a change? Or for a modest investment in paint, cabinet hardware and new counter tops, you can update for kitchen for a quicker sale. Let’s get started: Consider what’s fresh and timeless versus what home-buyers consider dated and dreary. # 1: Consider painting your wood cabinets, (yes I said it, paint your wood cabinets!). It’s ok to paint wood. Hire a professional painter to get the job done fast and efficiently. Bright white and wood look charcoal plank tile floors as shown in a model home at the Oaks at Portola Hills. Take a tour of model homes in your area to get a sense of what is trending in your town. # 2: For a bit more elbow grease, route out the door panels and add clear glass for a vibrant change in your wall cabinets. # 3: Add cabinet hardware to your cabinets. It’s the jewelry in the kitchen. Brushed nickel or polished chrome knobs and pulls add a nice touch. 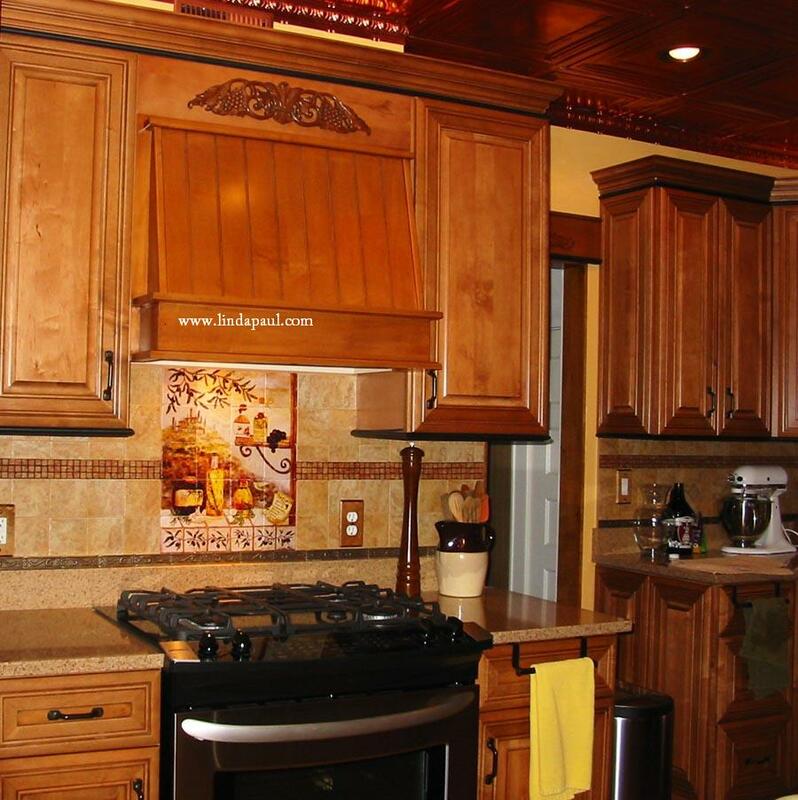 #4: Are your wood stained cabinets in good shape but the counters are Uba Tuba or Baltic Brown granite? Rip out the counters and splash! Install new counter tops in a light quartz. Back splashes with a little pizzazz becomes a focal point in the kitchen. Cherry wood with Mosaic stone and glass tile for the splash and quartz counter top. Pick up any kitchen magazine and you’ll find a majority of the covers show kitchens with quartz or quartzite counters. Dark & busy counter tops appeal to fewer people. Even the quartz manufacturer’s weed out dated colors. I just threw out 10 sample blocks from one of my vendors that discontinued colors that were popular 4 years ago but not today. Edit out what doesn’t work. Solid color quartz counter tops or marble and “marble-like” are in high demand for most of my clients. 3 x 6 white subway tile and honed quartz counter top. And finally tip # 5: The most popular back splash today: Subway tile! Painted kitchens and subway tile are always a classic winner! A client came to us after seeing our fabulous contemporary display in an appliance showroom, but once they saw our classic white display with subway tile, the decision was done. This style evokes immediate love for classic good looks. Update the back splash with a classic white subway tile! It is timeless and one of the more affordable back splash tiles available. Paired with new counter tops, paint white cabinets, new hardware, a new faucet and stainless steel sink will transform a kitchen into an appealing space for a home buyer to consider. And if you are in the Orange County area and need help with your dated kitchen, please give me a call for an estimate. 949.448.9627. A reader asks what the back splash tile is on the set of ABC’s Brothers and Sisters. I have talked about Nora Walker‘s kitchen set before, http://wp.me/pcRAx-1Z, but I thought I would open it up to my social media design aficionados. What do you think it is? Like a lot of my readers, we tune into certain shows just for the set design. This set has definitely received much attention. I think you can get the whole series on DVD now. I rarely have the patience to sit through a one hour drama but will tune in just to see what materials are used in sets. It’s kind of fun, like furniture forensics and design deconstruction. Here are a few snippit photos to check out the most important room, (at least to me), the kitchen. So, what do you say, is this a Walker Zanger tile or something else? This island is on wheels for getting the best camera angles. Product Placement in Movie and TV Sets, consumers will want to know every little detail shown. It’s a bonus if your product is shown on a popular show. What is the tile they used in this set? Preserving the history of design and craftsmanship through inspired contemporary design. How does architectural history translate into kitchen and bath products? View pics at KBB online to view stunning products inspired by the architectural elements found at Hearst Castle. Once the private home of publisher William Randolph Hearst, the estate also known as La Cuesta Encantada® or “The Enchanted Hill”, overlooks the spectacular California coast and was the shared design endeavor of architect Julia Morgan and William Randolph Hearst. Today Hearst Castle is a California State Historical Monument and State Park. Some of my favorite manufacturers have been licensed by the Heart Castle Collection to produce inspired reproductions from design elements found throughout the castle. Tilevera, Enkebol, Soko, Barclay Butera Home, Taracea, and Habersham to name a few. Not everyone can own a castle nor would want to furnish one, but the design details inspired from The Hearst Castle lend themselves beautifully into kitchen and bath projects inspired by the antiquities collected by Mr. Hearst from around the world. Fortunately for me, Hearst Castle, on the Central Coast of California is a short day trip to escape to. Designers, artists and artisans from all over the world come to Hearst Castle for inspiration for their own reasons. Whether they come for inspiration for a major product line or for a one of a kind studio piece, the one thing they all leave Hearst Castle saying that in their wildest dreams they never imagined what an inspirational design resource it is. For every client I have worked with there has always been a pivotal inspiration point for the design. Be it a color, a view, a vacation getaway, there is always a trigger point that inspires a design direction. What inspired your last renovation? This past week I had the pleasure of learning about CaesarStone’s latest quartz surface, Motivo™, at a local NKBA chapter meeting generously hosted by Mitrani Shower Doors and Caesarstone. Motivo is a textured embossed quartz surface available in two textures, Lace and Crocodile, that can be used in wall panels, furniture, counters and more. Viewing a small sample does not do it justice. It must be seen in a large application. In my local area, Mitrani Shower Doors, in Woodland Hills has two large installation shown in their shower displays. The texture resembles the authentic pattern found on a crocodile. Stunning. Cool looks, new finds or what I love today. Always on the hunt for fabulous finds, check out what is catching my eye. I discovered a great new kitchen website called Beautiful Kitchens where I first found this funky glass back splash designed with red circles. It is from http://www.funkysplashbacks.com. Heath Ceramics, dimensional tile was just what this kitchen needed. The tile pattern wakes up an austere kitchen with flat one dimensional surfaces. Here is the same pattern by Heath Ceramics, shown in a matte brown. I have always loved this pattern. The same tile takes on a whole new appearance with a theatrical look. Almost as if a curtain is rising, using 3×9 shaped oval tiles in a custom color. Photo: © Annie Schlechter. This is in the Maritime Hotel, (Matsuri Restaurant), New York City in the Meat Packing District. The clean contemporary lines of The Cube collection appear to have no visible seams. Are you ready to submerge? As in, get ready to get your body submerged in a deep tub. The BC09 from the Cube Collection is 30″ wide, 60″ in length and 24″ deep. 67 gallons. Comes with a Wenge tray. A drop in tub available in a 1, 2 or 3 wall configuration. Glossy or matte finish. Designer note: I do not recommend this as a tub/shower application. A 24″ depth is awkward to climb in and out of for a shower, especially for people with mobility problems or small children. The BC11, from The Cube Collection. 60″ x 32″ x 17 3/4″, 70 gallons. The BOV02, from The Ove Collection from Wetstyle. It’s great that it has a wider ledge to lean sit on and swing your legs over and into the tub. 72″ x 36″, 65 Gallon capacity to overflow. S 1978 Also from the Niche Collection from Wetstyle. Clever storage ideas for the tub collections. This year I would like to open up the blog with guest contributors, talented artisans and experts that are only too generous to share their expertise, knowledge and design ideas from their point of view. To get the conversation started, I am delighted to introduce Linda Paul, an internationally recognized American Artist and owner of Linda Paul Studio in Colorado. Without further ado, I welcome Linda as a guest contributor to Kitchen Design Notes. As an artist I am profoundly influenced by color and culture. I love studying color trends and am always trying to predict and influence color. Color trends are fascinating because they are a sociological barometer of the desires going on in our culture right now. Color is important in our lives because of the way it makes you feel. 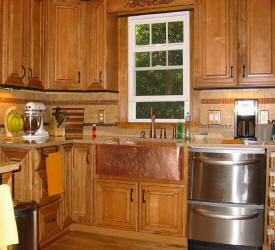 Copper farmhouse sinks, copper tiles and stamped ceilings are a fabulous design trend in kitchens. Picture left: Check out this copper sink. Copper mosaic tiles run through the center of the backsplash and around the entire kitchen. Here are a couple of fabulous wall paint color ideas and samples. I have backed the beveled glass of this heron artwork in pure copper, gold and silver. The center mirror reflects the view out my studio window. Purple as well as yellow are trendy colors for 2010, but use them sparingly in accents etc. Pantone favors turquoise for 2010, but its should only be used as an accent color, not as an interior paint color. This is the story of Linda Paul’s artistic journey: Linda Paul was an urban planner and developer in Ontario, Canada. She married and immigrated to the United States in the early 1990’s and found herself without a green card. With boundless time on her hands, she spent many hours walking the beaches in the San Francisco bay area. She would pick up pieces of dried seaweed and examine their shape. Deciding the sea plants looked like people, she decided to haul some home and paint faces on them. If this sounds very childlike, it was! Having painted the faces, she needed something to stick the seaweed people in. Some plaster should do it. Then needing to paint the plaster, she bought some basic kindergarten powder in dark blue, and voila, her first piece of art was born. It really looked like something a six year old child had created, but it was exactly this innocence and complete freedom that led her on. Liking the texture of her first “creation” , her brain thought, “I wonder what some plaster carrots would look like on a board. Off to the lumber yard for plaster and the grocery store for carrots! Her second piece was called “Flying Carrots” (see below) Something in her mind just opened up like a tidal wave and she was smitten with creating. Liking the vegetable theme, she created three more sculpted vegetable pieces and boldly entered them in an art juried art show in Burbank , California. She knew right there that this was to be her new path in life. 15 years later, Linda Paul is now an internationally recognized and collected bas-relief and egg tempera painter. How about a little "Relief"